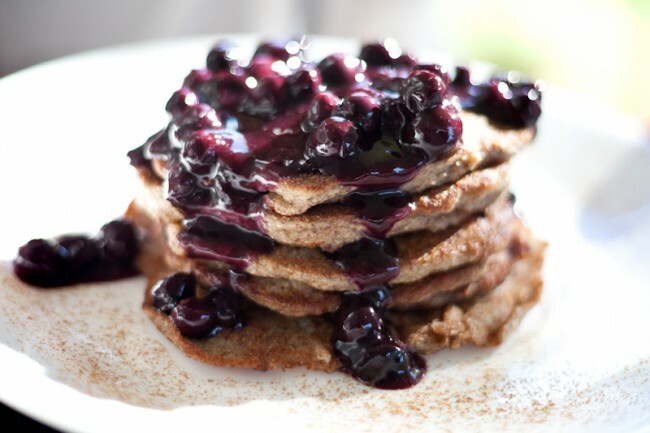 These pancakes are fuel for your brain. They give a sneaky, decent clout of vegetarian protein and omega 3 fatty actids, and the blueberries provide a rich source (sauce) of antioxidants that are clinically proven to enhance brain activity. Mix the wet ingredients into the dry, and stir well. Lighly grease a pan and heat to low-medium. Spoon 1-2 Tbspns of mixture into the pan per pancake and fry lightly, flipping once, till each pancake is golden brown on both sides. Heat the all ingredients except xanthan gum in a small saucepan on medium heat, and stir until they are all nicely melted together. Add a dash of extra water and the xanthan gum, and continue to stir until you have a thick sauce. Yum! I’ve just whipped these up for hubby and I, without a doubt this was delicious! I even have photo of my creation on instagram. Yvonne Goedemondt on Rice Paper Rolls Video – Feeling Chilli?